'Tis the season. Our Christian radio station has switched to playing a whole lot of Christmas music, there is Christmas stuff up in all the stores, and I even saw a house all lit up with Christmas lights last night. I'm not quite ready for Christmas for real, but since I blog a few reviews, I so have the chance to be "doing" Christmas a bit before I'd otherwise be ready. Today, I'm reviewing some Christmas music. 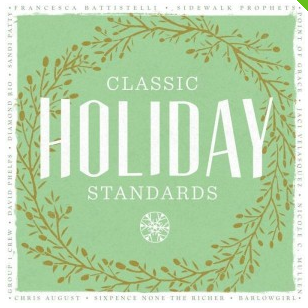 Specifically, a CD called Classic Holiday Standards. We put this in while trying to get the kitchen cleaned up one day, and we weren't terribly impressed. But we were pretty distracted, so I knew I had to listen again when I could focus a bit more. I played it again while cooking dinner, and I enjoyed it a lot more that time through. Now that I've actually heard the whole CD, I think it would work as background music. There are some great artists on here, like Francesca Battistelli, Point of Grace, Sixpence None the Richer, Jaci Velasquez, Nicole C. Mullen, and Sandi Patty. Marshmallow World (Francesca Battistelli) is really a lot of fun. I'm still not sure why My Favorite Things (Sandi Patty) is on a Christmas CD, but it is beautiful. Most of the other songs are a lot of fun too, though a couple are just a little out there. I'm glad to have it as part of my Christmas music collection! Would you like to win a $25 appreciation certificate, to be used at Family Christian? Enter below! I never thought to do any research on it. I just thought it was weird. Maybe also the "doorbells and sleighbells," "snowflakes and silver white winters?" I'm willing to lump it in with all my other Christmas faves. Not the least of which is "O Come, O Come Emmanuel." "Marshmallow World" definitely sounds fun and interesting. "My Favorite Things" is on another Cmas Cd of mine - Lorrie Morgan's. I always assumed it talked about snowflakes and mittens so why not? This sounds like a fun CD, my husband and oldest son particularly love holiday music! A Francesca Batistelli Christmas song -- I definitely need to hear that one. I like a lot of them, but always love to hear Bing Crosby sing White Christmas.